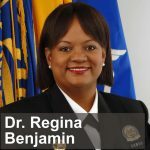 Regina M. Benjamin, M.D., M.B.A., was appointed by President Barack Obama as the 18th United States Surgeon General in July, 2009 and served a four-year term. Dr. Benjamin also oversaw the operational command of 6,700 uniformed public health officers who serve in locations around the world to promote, and protect the health of the American People. Dr. Benjamin served simultaneously as Surgeon General and as the first chair of the National Prevention, Health Promotion, and Public Health Council (National Prevention Council) – 17 cabinet-level Federal agencies that developed the road map for the Nation’s health – The National Prevention Strategy.